Approximately 95% of the varieties we sell are open-pollinated and heirloom varieties that have been around for generations. We grow many of these varieties up at our farm for produce sales on-farm, at the hardware store, and to several restaurants in downtown Matthews. We do not and will not ever sell Genetically Modified (GMO) seed, and all of the seed we sell come from small businesses like ourselves, not the agribusiness giants. 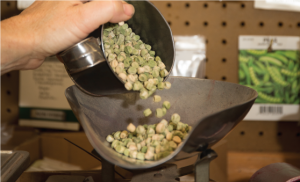 [www.wqseeds.com] A family-run operation in Garner, NC that supplies us with most of our bulk garden seed; asparagus crowns; cover crop seed; fescue, Bermuda, centipede, and zoysia grass seed; birdseed; organic fertilizers & pesticides and so many other gardening supplies. [www.dillonseed.com] Based in Dillon, SC Dillion Seed & Supply Company supplies us with hard-to-find bulk vegetable seed, onion sets, garlic, Irish seed potatoes, bulk wildflower mixes, and more. 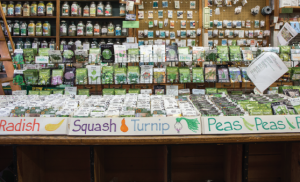 [https://livingstonseed.info/] Livingston Seeds has been in business since 1850 and offer an enormous selection of tried-and-true backyard garden varieties. [www.highmowingseeds.com] The first organic seed company to become certified as Non-GMO Verified. HM grows a wide array of unique heirloom and open-pollinated varieties of seeds loved by both home gardeners and organic farmers. 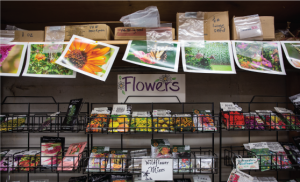 [https://www.seedsavers.org/] A non-profit seed company whose mission is “to conserve and promote America’s culturally diverse but endangered garden and food crop heritage for future generations by collecting, growing, and sharing heirloom seeds”.